Where can you find a history of immigrants, gangsters, and lost treasures all while feeling a cool breeze blowing off the waters? New York Harbor, of course! This iconic and essential estuary is located at the center of a system of waterways spanning an area of 1,500 square miles and consists of over 700 miles of coastline. It is one of the world’s largest natural harbors, comprised of the Lower Hudson River, the Upper New York Bay, and the Lower New York Bay, with a stretch of water named The Narrows dividing the two. It exists as a result in a postglacial rise in sea level, sinking much of the land under water until the area that we know as New York City was left, 150 miles closer to the sea than it had been. Because of New York’s location, many new immigrants found themselves entering the United States through New York Harbor via Ellis Island, and the Statue of Liberty became an emblem of the freedoms found past the Harbor. Between 1892 and 1954, Ellis Island welcomed over 12 million immigrants to New York and the nation beyond. Like the many immigrants, goods also came flooding into the Harbor. By the late 19th century, it had become one of the world’s major international ports, receiving hundreds of shipments a day. By the 1930’s however, the maritime livelihood of the harbor declined, leaving gangsters to take over the shipyards, sinking the harbor into being known as an “outlaw frontier” where organized crime flourished unchecked. By 1948, all 906 piers found within the Harbor were well under the control of mobsters who forced merchants to pay exuberant rates to ship and receive their goods. It was these mobsters who inspired works such as The Godfather and The Sopranos in later years. Even today, ships transport ninety five percent of goods imported into the United States. With an estimated 4,811 ships entering the Harbor in 2010, over one $175 billion worth of goods came in the United States via New York Harbor. Yet boats and imports are not all that can be found in these waters. Other items lurking in the waters include: a freight train, dead bodies, stripped cars, a formica dinette table, a piano, a dead giraffe, about sixteen hundred silver bars, and several scrapped Good Humor ice cream trucks. So next time you take a cruise around the harbor, think of all the things coming in as well as the things buried below. 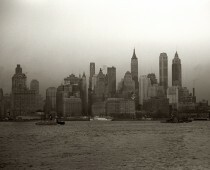 It is only because of New York Harbor that the City became the great metropolis that it is today! Cameron, Alastair. (2011). Gentle marimba. Retrieved from http://freemusicarchive.org/ music/Alastair_Cameron/Free_Film_Music_cameronmusiccouk/gentle_marimba. Bone, K. (1997). The New York waterfront: evolution and building culture of the port and harbor. New York: Monacelli Press. Johnson, M. M., & Schulberg, B. (2005). On the waterfront: the Pulitzer Prize-winning articles that inspired the classic movie and transformed the New York Harbor. New York: Chamberlain Bros..